Installing B&R v9 on Windows 2012R2 and connecting over SCVMM to my Hyper-V hosts. 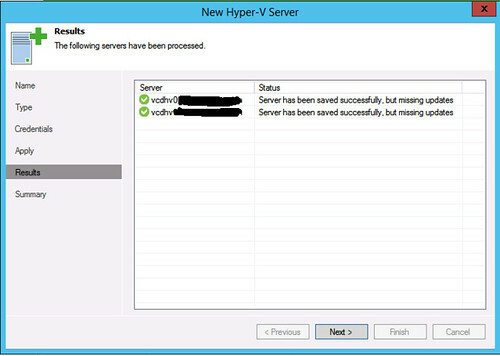 When connecting the Hyper-V hosts to Veeam, I get the following message after the hosts have been connected: "Server has been saved successfully, but missing updates". Is the missing updates part for the hosts? Is it important? Is there impaired functionality? If you select one of those servers and then click the "missing updates" button in the backup infrastructure view, it will list hotfixes and updates to Server 2012R2 which we believe are needed for correct and stable function of backups on that OS. Ok, will check that. Thanks! Here is an existing thread with a similar topic > v8 Question "One or more critical updates are missing"